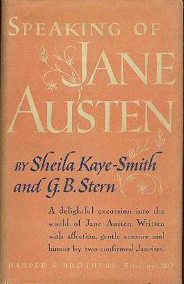 Having discovered Heyer a decade ago, I thought I’d read all her best works. But no, other bloggers assured me, I still needed to read The Talisman Ring. Nonsense, I thought, but it was Heyer so I was determined to read it anyways. Of course, I discovered that everyone was right and that this hilarious tale of a fanciful young woman, a dashing smuggler, and their put-upon elders is indeed one of the greatest things Heyer wrote. 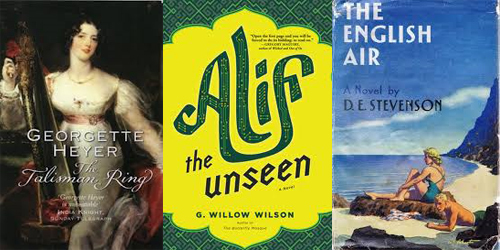 I struggled to review all the books I wished to this year and that included some of my favourites, like Alif the Unseen. An extraordinary combination of fantasy, religion, and 21st technology, this story of an Indo-Arab hacker who finds himself on the run from the corrupt state authorities is powerful, timely, and above all, engaging. It was one of only two books this year that kept me reading until late into the night (the other is #6 on this list). Stevenson is an author whose quality varies dramatically from book to book. I love her but most of her novels are merely good rather than excellent. The English Air is one of those excellent exceptions, sensitively following the struggles of a young German man who finds himself torn between England and Germany at the beginning of the Second World War. Stevenson paints as alluring a portrait of the domestic charms of middle-class pre-war England as anyone but it is her intelligent handling of Franz’s divided loyalties that makes this rise above most of her other works. This quirky and touching romantic comedy about a socially inept Australian scientist’s search for love was an absolute delight. I loved it so much in fact that I read it not once but twice this year and am now busy pressing everyone I know to read it too. Kay, the master of historical fantasy, has now published two books inspired by Chinese history: Under Heaven and River of Stars. 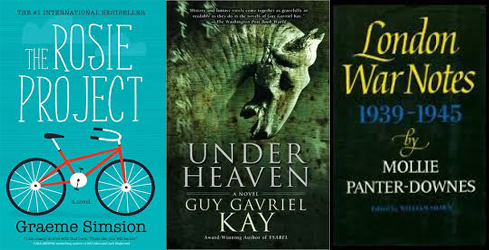 I read both this year and both are extraordinarily good but Under Heaven was, to me, the most absorbing. Kay is astonishingly good at balancing character development, political intrigue, and action, making for a book that left my pulse racing and my mind whirling. The fact that I was even able to get my hands on a copy of this all-too-rare book was a miracle; as anyone who has had the privilege of reading this will agree, it is a travesty that it has not yet been reprinted. During the Second World War, Mollie Panter-Downes’ “Letter from London” was published every second week in the New Yorker magazine, giving her American readers a glimpse of the wartime experience in London. In typical Panter-Downes fashion, she is observant and articulate, intelligent and unsentimental. These letters capture Londoners at their best and worst and are an extraordinary historical record as well as examples of first-rate journalism. I had some reservations but, for the most part, I adored the fourth book in Trollope’s Barsetshire series. Trollope’s handling of the virtues and failings of his young men reminded me once more of the truthfulness of his writing (and the consistency of human beings, regards of the century) while his female characters, young and old, were delightfully strong, funny, and sympathetic. 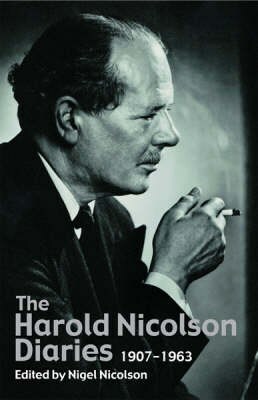 An absorbing and revealing collection of wonderfully-written diaries and letters, I loved getting to glimpse all the different facets of Nicolson’s character, from youth to old age. In another year, this might have grabbed the top spot. Fermor’s account of the first leg of the charmed journey he took across Europe as a teenager is beautifully written and had me longing to set out on adventures of my own. All the other titles on this list were wonderful but not nearly as wonderful as this collection of delightfully eccentric Austen-focused essays. And, of course, it is the only book I have ever come across that spends a sufficient amont of time lavishing praise on the deserving Emma (if you are looking for the fastest way to my heart, look no further). We all have our childhood heroes. Some people spend their adolescence admiring athletes or film stars. 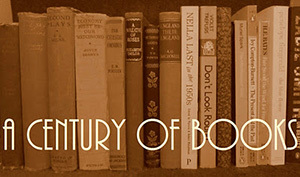 Some dream of growing up to be the next Austen or Hemingway. In my case, I spent my teen years slightly obsessed with 20th Century diplomats and politicians. At some point, my intentions to purse a diplomatic career waned (probably when I realised I lacked both the tact necessary to succeed in that field and the bilingualism that is a prerequisite for any kind of government post) but my fascination with the diaries of those whose lives were devoted to civil service has never faltered. I suspect Charles Ritchie will always be my favourite diary-keeping diplomat but after reading The Harold Nicolson Diaries edited by Nigel Nicolson earlier this year, I must say that Ritchie finally has a rival for my affections. 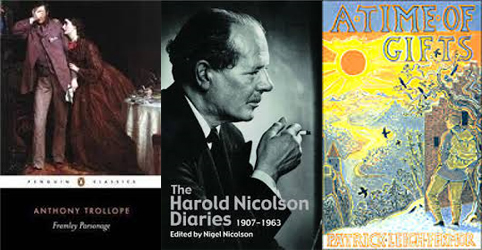 For years, I have been reading history books about wartime Britain where Nicolson’s diaries were heavily quoted. His career during that period I was familiar with: a diplomat turned writer turned politician, Nicolson was among a small number of MPs who spent the years preceding WWII believing and arguing that fascism needed to be confronted and defeated rather than ignored or appeased in an effort to ensure peace. He was never a brilliant politician but he was intimate with those in power and his diaries offer a fascinating glimpse of the government in wartime. I do not think that, except for Winston [Churchill], I admire anyone as much as I admire you. I remember your saying (years ago) that you had never established a complete relationship with anyone. I don’t think you ever could – since yours is a vertical and not horizontal nature, and two-thirds of you will always be submerged. But you have established, with your sons and me, a relationship of absolute trust and complete love. I don’t think that these things would be so fundamental to the four of us were it not that each one of the four is a private person underneath. I have often wondered what makes the perfect family. I think it is just our compound of intimacy and aloofness. Each of us has a room of his own. Each of us knows that there is a common-room where we meet on the basis of perfect understanding. I am thought trashy and a little mad. I have been reckless and arrogant. I have been silly. I must recapture my reputation. I must be cautious and more serious. I must not try to do so much, and must endeavour to what I do with greater depth and application. I must avoid the superficial. Now that you have been admitted into the Church and had a paragraph all to yourself in the Daily Telegraph, you should be able, if not to read, then at least take in, private letters. And will you tell your mother that I really believe that you will have large eyes as lovely as she has and a character as sweet as hers, and that I really will not spoil you when you reach the age of 2, since I detest spoiled children. And even if I do spoil you, I shall do so surreptitiously in order to avoid a look from her like the spoon-look. I am so happy to have made the acquaintance of Nicolson the family man after having known for so many years only Nicolson the political observer. He is wonderful in both roles but so much more interesting to me now that I have a clearer, more complete idea of his character. Each page of this book was a delight; it is, without a doubt, one of the best books I have read this year and one of the best diaries I have ever read. Nicolson has certainly earned his place alongside Ritchie on my bookshelf.